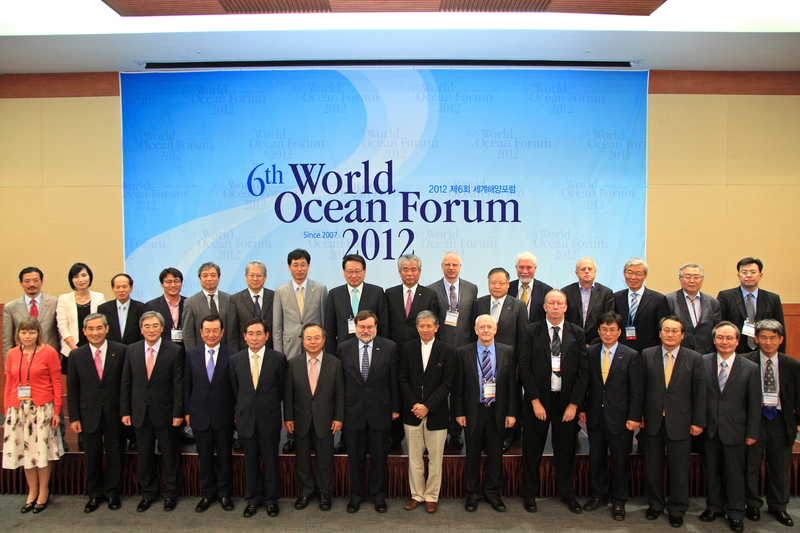 In 2012 I was delighted to accept an invitation to make a TED-like presentation at the 6th World Ocean Forum, South Korea. This unique event spanned a variety of topics related to the seas and Oceans; from conservation and ecology through to transportation and resources. The wide ranging format gave the participants the opportunity to get a broad view of the interrelationships of activities and the vital role the ocean has in supporting man's existence. In particular it gave us a chance to break out of our usual silo-specialist thinking. My thanks and best wishes go to all those who helped make this event so enjoyable for me. New friendships were made and new business relationships became possible. In keeping with the conference’s theme “Blue Frontiers” my presentation was titles “The Blue Freeway”. It presented a scenario in which seas, rivers and lakes were the basis of ‘freeway’ quality transport, offering 100 knot high speed travel with comfort, efficiency and safety – yet without actually building a road. Instead, Wing in Wing in Ground effect craft are used. It covered the basics of ground effect technology, the current state of the art, together with a projection of likely market-focused evolution for commercial viability. 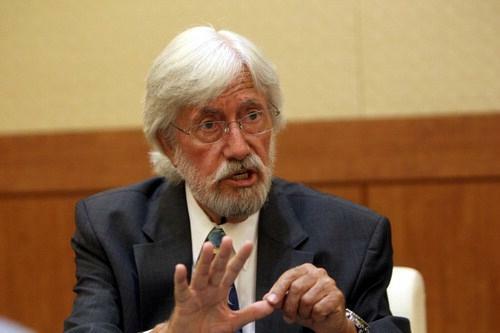 It was particularly relevant as South Korea have at least two current WIG projects emerging at the time. Names and faces: unfortunately I don't recall all the names to the people at this event - but I would like to. If you are in a photo, or know someone in a photo please drop me an email so I can include that information in the credits. Also, if you have any other photos of the event I would be delighted if you could share them with me. Munching in Munich between connections. My first view of South Korea. Skyscrapers and blocks of flats tended to make the landscape resemble a Samsung printed circuit board. View from the hotel roof. Here the beginnings of the Busan bridge. Taking a walk down to the waterside. The extraordinary mermaid statue in the foyer of the hotel. We passed it every day. Is it art? Lunch on my first day. Seafood pasta Korean style. An Italian/Korean fusion that was really good. I have seen a sign. Traffic management South Korean style. There could often be four or five of these guys at busy junctions all blowing whistles and waving red sticks. By my hotel window - An abseiling device for escape in case of fire in a box the size of a first aid kit. One wonders how many occupants of a room can use this. I was on the fifth floor and I wondered if the box this was attached to contained enough rope to reach the ground. The hotel had 21 floors so one only hopes the boxes in the higher floors were bigger…. In the underground entrance to the "worlds biggest departments store". A whole new subterranean world can be found underneath the pavements of the major roads and buildings. Inside the "worlds largest department store". In the food hall of the department store. Let them eat more cake. Cake is a very big thing in South Korea. A display stand to help customers chose their meals. All this food is artificial – made of plastic. By and large the real food presented to the customers looks identical. Eating out - one of the stands in the food hall. The location of my first meal evening in South Korea, though at the time I was eating it was pretty crowded. This is what I chose for tea on Sunday evening. This display food is made of plastic. The dish they served looked identical but no doubt tasted better. Various food in the food hall. Looking out to sea at night. View from the top of the hotel. Everyday they build more cars. Just to prove I was here. Just to prove I was there. The reception was held at the historic APEC Nurimaru building, built for the 2005 APEC Economic Leaders' Meeting. The evening reception, with sea view. What is that in the background..? Keeping the subject on ice over dinner. School children gave a fantastic choral performance. After the wine we move on to beer, which the South Koreans take very seriously indeed. At the end of the second day we retire t a local bar and plan an assault on the nearby Korean barbecue. Dropping the charcoal into the burner in the centre of the table. Our waitress gives us a demonstration of the Korean bbq. An egg soufflé is served. Interesting. Getting into the Korean BBQ. A fine spread is set before us. Retiring to the hotel bar we find some locals enjoying a strange iced tower of beer thingy. At the start of our city bus tour we find a children's ride outside the Worlds Largest Department Store. A group of us decided to go on a bus tour of the city. Here is a view of the city taken from that bridge. The bus tour of Busan city took us over That Bridge again..
View from another bridge. Much of the city looks just the same. Glad I am not navigating. Ever wondered what it looks like at the other end of the European shopping supply chain. We were thinking of visiting the Busan Aquarium, but there seemed little point as these all-you-can-eat aquariums were all over the place. The women in the market spend so much of their lives squatting down shelling molluscs that they can no longer stand upright. The morphing skills of the octopus are challenged by an orange plastic bucket. These guys are skinning eels, whose heads they impale on a nail on their chopping board to hold them. Even though they dispatch the eel with a cut to the back of its neck beforehand it made me cringe every time they slapped an eel onto the nail. Baskets of Fruits de Mer. Festoons of strange dried fish. Could not help but feel very sorry for these fishes. A crab with film star looks; Face-hugger. Remember our friends the cuttlefish. Possibly the grossest thing I have ever seen. Some sort of sea worm things all still alive. Now that's what I call a prawn! We had lunch in the restaurant by the fish market on our Busan City Tour. Our restaurant by the fish market in which we had various unknown fishy items cooked in a variety of ways. Dried fish - what must it take to sort this lot into the different boxes must take some time. Where do they all come from.....? We look a look around the Busan museum. Early Man in late afternoon. It was at this point we got told off for using flash photography. So much for Homo Sapiens evolved intelligence. Museum exhibit of the old ways. Busan beach with that ever-present landmark. Not so much a bridge - more a bypass built at sea across the bay. Try getting this past the planners at Torquay. After a grand day out we chill out with our second visit to the Korean BBQ. One 17 hour sun-chasing plane journey later... in the sky over good old Blighty. In a holding pattern over glorious Romford before final approach to Heathrow.